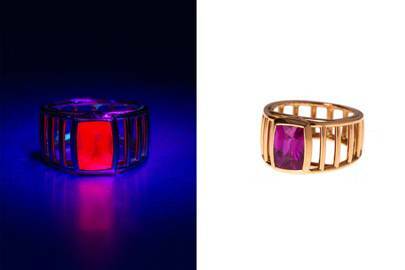 Cora Sheibani is turning heads with a new jewellery collection featuring gemstones that turn fluorescent under ultraviolet light. 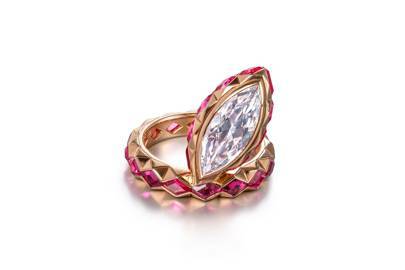 Disco ring, 18k rose gold set with strongly fluorescent 2.53 carat DIF marquise diamond and kite shaped jedi spinels. Everybody knows the route to the most desirable diamonds: the Four (Holy?) Cs: cut, colour, clarity and carat weight. 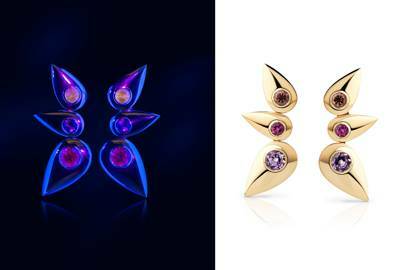 Jeweller Cora Sheibani now suggests we should add an F for Fluorescence. 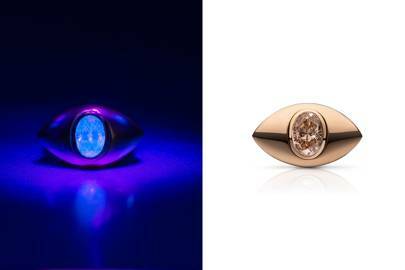 With Glow, her latest collection, the jewellery designer celebrates this magical yet rarely celebrated natural gemstone quality that creates an other-worldly, colour-change glow when the gem is exposed to ultraviolet light. The collection, which will be unveiled at the Louisa Guinness Gallery in London and will be on show until April 30th. 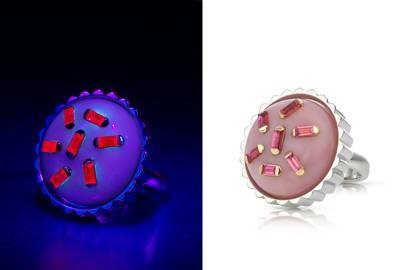 It features rubies and spinels that fluoresce a traffic-stopping red, a mauve tourmaline that radiates lavender blue and brown diamonds that glow a dazzling white. The Disco ring is as beautiful in natural light as it is under UV, something Sheibani considered essential to the collection's success. The star of the show is an original design, the Disco ring, which features a magnificent marquise-cut white diamond that fluoresces a bright neon-blue worthy of the dance floor lights at Studio 54. It is surrounded by serpent scale-like Burmese Jedi spinels so-called for their unique glow “that has no dark side”, she says. It is perhaps no coincidence that they also glow a lightsaber-red. Small eye ring, 18k rose gold set with 2.01 brown diamond. Sheibani has had a passion for fluorescence from an early age. “As a child I liked always going to the mineral rooms at the museum and seeing the exhibits glow under the UV lighting,” she says. It was only recently however that she was struck by the contradiction in how the quality is viewed in different gems by gemologists and jewellers alike. Valence plus ring, 18k rose gold set with 3.21 carat pink sapphire. “Diamonds are considered less pure if they fluoresce whereas the value of Burmese rubies increases the more highly they do so,” she says. “It is bizarre and exciting at the same time.” Having amassed a treasure trove of glowing stones, she got to work on creating a collection that includes new designs as well as fluorescing versions of her greatest hits such as a cupcake ring that glows with pink spinels and a cloud brooch of fluorescing white diamonds. Large Cupcake Ring, 18k Rose and White Gold set with pink Opal and pink Spinel baguettes. Butterfly earrings, 18k rose gold set with kunzite, rubellite & tourmaline.